NEW YORK—The city council is eyeing a potential ban of private drones and the addition of fines, in two separate bills Wednesday. 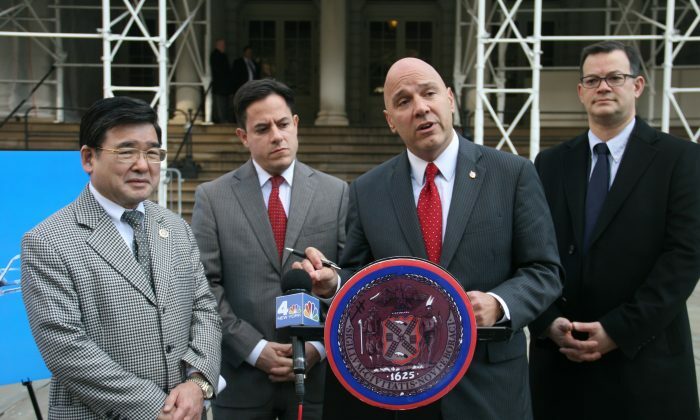 The first bill is “more of an outright ban” of drones, proposed by Council member Dan Garodnick, and the other will create fines and areas where drones are prohibited, proposed by Council member Paul Vallone. The two bills may be combined, but that decision will be determined by further council committee review. Drones, also known as unmanned aerial vehicles (UAVs), can be purchased for less than a hundred dollars depending on the model. The easy access fuels fears of people attaching bombs in potential ‘lone wolf’ attacks or attaching cameras on for spying. Council members expressed concern that drones are not regulated enough on the federal level, which poses a risk to public safety and privacy. There have been a number of “close call” incidents between drones and commercial and city air traffic where drones flew too close to the latter. Although New York sees a large amount of air traffic, “its skies have remained lawless with the increased usage of drones,” said Council member Corey Johnson. City agencies, including the police, would be exempt from the fines and prohibited areas, but Garodnick’s bill would require police to obtain warrants before using drones. As for those who would like to see drones deliver pizza to their doorsteps, Garodnick quipped, “Let’s not rush toward a Jetsons’ future,” referencing the futuristic cartoon television show. Mystery Drones Are Buzzing Around French Nuclear Plants—Should We Be Worried? What Do You Need to Know to Fly a Drone? Spying Killer Drones Farfetched, But Legal.